Can you imagine the chaos if McDavid had picked #87 to wear? 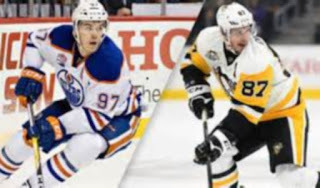 With Connor McDavid and Sidney Crosby set to square off in less than an hour from Rogers Place in sunny frigid Edmonton and with ticket prices soaring past $500, tonight is a showcase of the best the NHL has to offer fans. McDavid and Crosby are #1 and #2 in the scoring race (Malkin is also tied for 2nd with Crosby), and both teams' trajectories have them reaching the NHL playoffs come spring time. Given the hype and hyperbole surrounding McDavid– a spotlight similar to that given to Sidney Crosby when he joined the league– I thought I would reach out across the Twitter Universe and get some Western Conference feedback regarding McDavid and the Oilers, and how their season has created expectations for the Edmonton fan base. Here is Oilers' fan Jason (@jrmccrank) on McDavid, the Oilers, and Marc-Andre Fleury heading west. What has the Oilers' progression been like since McDavid joined the team? I know you've lost a few of your prior high draft picks along the way. "McDavid and Talbot have been the primary cogs in the Oilers' success as a whole. The larger, more physical presence of Lucic and Maroon at forward has cultivated a "respect" factor, especially against teams in the West. Lucic in particular doesn't need to engage. His presence speaks to other teams. The team is slower than years past, which has led to problems against faster clubs like the Maple Leafs and many of the eastern clubs. Chiarelli built a team to compete against the Pacific division. So far, so good. Results may vary against other divisions and teams." Given the Oilers' success this year (especially relative to seasons past), what are fan expectations like? Do they envision a Cup run similar to what Crosby enjoyed, or are Edmonton supporters wary to get TOO excited too quick? "My expectation? Just a playoff spot. The Flames' current run has made me feel uneasy, especially considering that we swept them in the season series. If the shoe was on the other foot we would be buried." Still, this season has to be considered successful for Edmonton fans, yes? Even trading Taylor Hall to New Jersey has (somehow) seemed to work out in the Oilers' favor. "All in all we've seen vast improvement. The team needs to bear down over the final 16 games though. The potential for disaster is still there." Finally...Edmonton has long been mulled as a potential destination for Pittsburgh fan-favorite, goaltender Marc-Andre Fleury. Given the play of Cam Talbot, what is the Edmonton fan base reaction to #29 potentially joining the Oilers next season? "I would take Fleury in a back-up role. His salary might be a issue. Talbot doesn't make an insane amount. 3.5 mil per I believe." Sorry Fleury haters, it seems like you may be able to scratch Edmonton off of the list of teams that Fleury might be traded to prior to the expansion draft!